Pupils of all ages and abilities are welcome both for doing grades and just for enjoyment. Her current pupils are aged between 5 and 90! Boosting the pupils' confidence is important to her, and so is the fun of playing. She also has a specialist training to help with tension related problems, like breathing difficulties, tense shoulders, back pain, tennis elbow etc. Udita is the very best teacher I could imagine for my daughter. She is highly professional as a flautist and as a teacher, very clear and straight forward the way she teaches, and a very friendly and patient person. She is giving so much confidence to my daughter that it seems to me she is not just learning flute playing very well, but also learning for life. Udita is endlessly patient. Under her tuition my playing has improved enormously. Somehow, she manages to instil confidence into my playing. 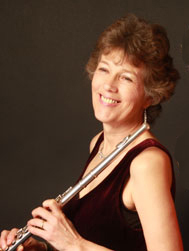 I consider her to be a rare personality and a superbly knowledgeable music practitioner. Her outlook is always welcoming and encouraging. She is an outstandingly gifted teacher and I would recommend her unhesitatingly to students of all ages.` B.P. I've been learning and playing the flute with Udita for many years and it has been an absolute pleasure, as every lesson Udita is so warmly welcoming and she has taught me so much. When I play... it wakes me up and my mind-set is positive and uplifted. I feel happier and I want to radiate my feelings to others. I always look forward to playing the fluteÉ Thank you for all of your support, hard work and kindness in all of the years that I have been your student. You and flute are an asset to my life.